It is time for that special weekend that happens only once a year, homecoming. This year the homecoming game is being played at Paul Brown Stadium. Don't forget that the homecoming parade takes place on Friday, more details here. 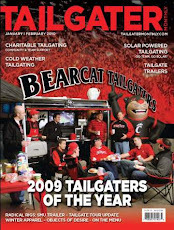 The Bearcat Tailgater Crew isn't going to let a location change damper what is always a great party prior to kick-off. In fact we are excited to support our Bearcats as they take on the Cardinals on the river. Kick-off is slated for 12pm. We will be setting up around 7:30am in Longworth Hall parking lot. If you came to the Oklahoma game, this is a great location and a short walk to the stadium. Map and directions to the Longworth Hall parking lot. We will have a wide assortment of morning tailgate favorites, beer and a bloody mary bar. All we ask is that you bring your favorite dish and drop us a few bucks to help us cover our expenses. Join us to ensure that you are ready to help cheer on our Bearcats to a win over the Cardinals and that the Keg of Nails stays in Clifton.